We are trying to get to the bottom of anyone experiencing 3G problems after installing iOS 6.1 onto the iPhone 4S on the Vodafone UK network. The reason we asking those having problems to come forward are simply down to a text message sent by Vodafone to a customer. One iPhone 4S user had a text sent to him saying “If you’ve not already downloaded iOS 6.1 for your iPhone 4S, please hold off for the next version while Apple fixes 3G performance issues. Thanks” – We here at Phones Review find this a little odd that Vodafone UK are sending text messages out to its customers, but then again stranger things have happened in the past. Do you own an iPhone 4S on the Vodafone network and having problems with 3G after installing iOS 6.1? As you all know by now Apple seeded its new iOS 6.1.1 beta to developers, but we do not understand about the 3G problems and why Vodafone iPhone 4S customers must wait for Apple to fix the 3G performance issues because the iOS 6.1.1 beta does not mention anything at all about 3G. The iOS 6.1.1 changelog mainly mentions things such as improvements to Maps for Japan, indicates upcoming toll roads during turn-by-turn navigation, Improved pronunciation of roads during turn-by-turn navigation and other Apple Maps related stuff. 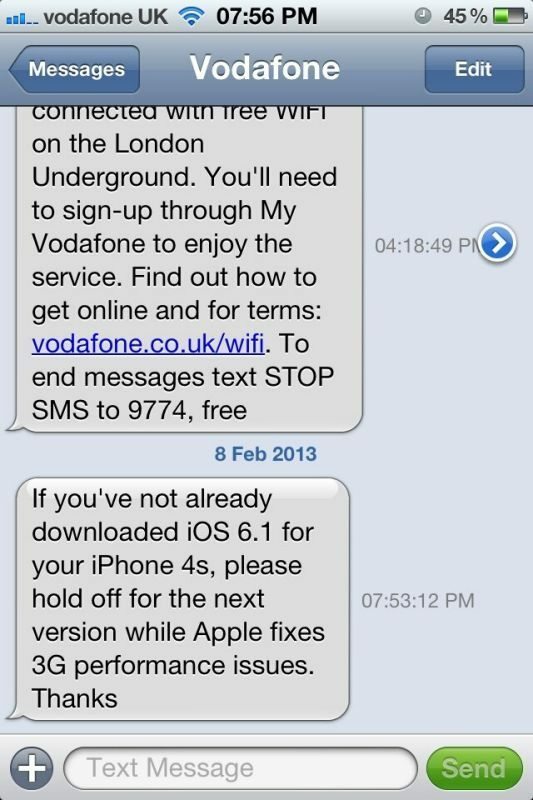 @sebastienpage @idownloadblog just received this SMS from Vodafone UK about updating to iOS 6.1, seems fishy somehow? Thoughts? Even though we are asking Vodafone customers to step forward, we would like to ask everyone if they are having 3G problems after installing the latest iOS 6.1 update. On T-Mobile (EE) noticed slight increase in Battery use since 6.1 not a lot else – very strange text from Vodaphone what do they know we don’t?